a committee set up on March 5, 2007, to investigate a toxic spill by a paint manufacturing unit in south Kashipur near Agartala, submitted its report on March 22 after failing to meet the original March 15 deadline. The committee consisted of two members of the Tripura State Pollution Control Board (tspcb), an agency that was itself strictured for permitting the unit to operate. On February 23, effluents from the Sah Paint Industry unit, which uses toxic metals, had flowed into the Howrah river, which flows past Agartala town into Bangladesh and is the main source of water for Agartala. Sixty-three people including 17 children fell ill and were admitted to hospital with respiratory and digestive disorders. tspcb was criticised for permitting small hazardous units in thickly populated areas without proper disposal systems for waste and toxic effluents. tspcb gave clearances to Sah for the discharge of effluents into the river in 2004 but the agreement expired in June 2005. The unit continued discharging its effluents into the river even after the deadline. tspcb had permitted 123 small hazardous industrial units to operate in the state but has been lax in monitoring them. 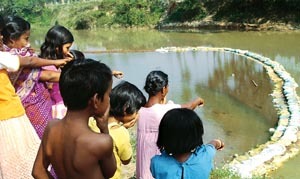 About 1,200 poor families live along the river and use the untreated water. Events following the spill pointed to several irregularities. First, it seemed unclear why it took over two years and a serious spill to realise that toxic effluents were polluting an important source of water. Second, ignoring opposition demands for an impartial committee, the government chose to appoint a committee comprising officials of tspcb, which was itself under a cloud. However, K P Goswami, environment commissioner and member secretary of the board, defended it. "As per the detailed project report of the unit, it was not a hazardous industry with a capital investment of Rs 4.5 lakh. tspcb is a regulatory agency that does not have any judicial authority to take action against any industry," he said. Whatever the powers of the tspcb, action was taken after the spill. The public health engineering department (phed) made a sand barricade around the contaminated area in the stream and pumped out the contaminants, said Pabitra Kar, cpi-m mla. "phed took steps to check the spill only after five hours. By then most of the contaminated water had flowed into Bangladesh," said Gopal Roy, Congress mla.